Speed Ryder #2, Fast Haze and Turbo Jack in 1 pack. 3 seeds from 3 different strains. 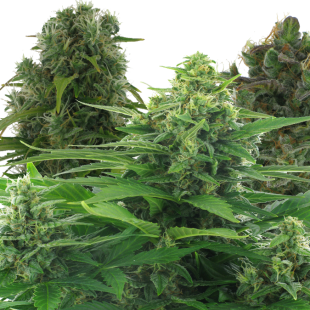 Get 3 of our autoflowering strains in 1 pack! Speed Ryder #2: Our own version of the famous Lowryder#1 x Santa Maria crossing. Improved taste, strong high and a great yield. Fast Haze: Large amount of sativa in this autoflowering strain with a traditional Haze smell and taste. Turbo Jack: Turbo Jack is a crossing of Ruderalis and some stable and reliable genetics in the line of Jack Herer and more. 1 Feminized seed each strain. Each seed is packed in its own tube.